We hope this guide helps you make some of those decisions, but sometimes your choice will come down to how it works for you in practice. Sometimes you have to try a few before you find what really works for you, but we hope to help you narrow it down a bit. If you are in a serious hurry to see what’s available at some of the lowest prices, click here to go straight to paddles at Amazon.com. 1 What type of paddling do you intend to do? 2 What type of paddler are you? 3 What type of material is right for your needs? 4 Do you want special features? 5 So what length of paddle is right for you? 5.1 How tall are you? 5.2 How wide is your kayak? 5.3 How fit are you? 5.4 Do you have shoulder or wrist problems? What type of paddling do you intend to do? This category might include family trips, short outings, fishing or wildlife photography or where you don’t plan to be out on the water a lot or for long periods of time. 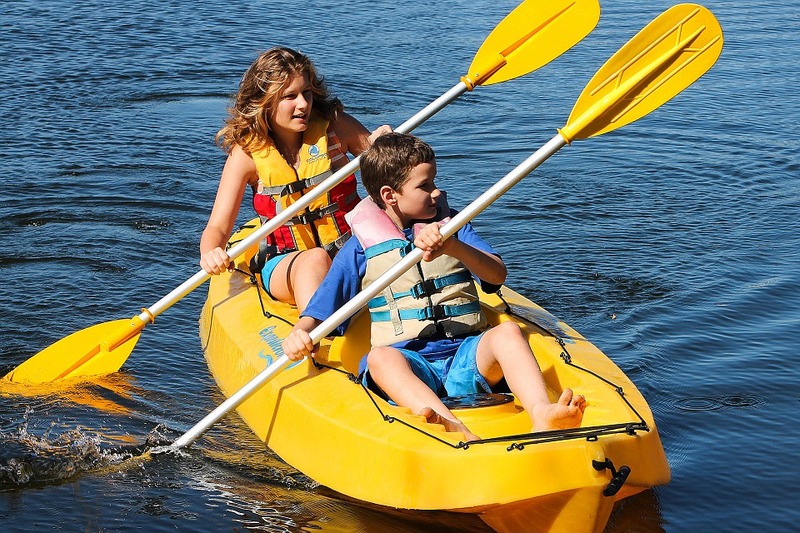 Recreational kayaks tend to be wider, from 26 to 30 inches or possibly more. Your choice of paddle will generally be of heavier construction but less expensive. This category includes day-trips and long runs on rivers and lakes….essentially a long time in your kayak. Touring kayaks tend to be longer and narrower, roughly 22 to 25 inches. You want a relatively lightweight paddle to minimize fatigue. Your choice of paddle might include an oval shaft so you can quickly orient the blades without looking. Oval shafts are also easier to hold. If you are paddling in deep water, you will want to consider your paddling style. More information on that can be found here. You might also want to consider a wider, plastic blade for shallow water. Plastic is more durable when hitting gravel and rocks. The wider blade means more blade in the water when it’s not completely submerged. Super energetic paddling and rough conditions can require special elements for your paddle. These kayaks are usually shorter. Your paddle should be both durable and lightweight. A composite blade might not be as durable as plastic, but should be a good compromise between durability and weight. You need a paddle that combines durability with efficiency for quick paddling strokes. The shaft should be carbon or fiberglass for the added strength you will need. No matter what, your whitewater paddle has a high likelihood of getting broken, so you will want to carry a spare, usually a compact paddle that can telescope or break down into pieces for storage. There may be reasons that you want a high-performance paddle for certain situations. If you are a paddling enthusiast you may be interested in the latest innovations in paddle constructions including the higher priced carbon shafts. minimize fatigue when moving the paddle rapidly. You may choose a stiffer blade to put more power into each stroke to increase your level of fitness. You may choose an ergonomic design if you have joint or back pain, to reduce strain. If you have sore shoulders, you may choose a lightweight fiberglass or carbon shaft. If you find yourself pushing off rocky river beds, you may want to choose a polypropylene or nylon blade reinforced with fiberglass or carbon fibers. This type of paddler keeps the shaft closer to the water, more horizontal, for a more relaxed stroke, usually with a slower cadence. It is an efficient stroke that minimizes fatigue, especially on long trips. The low-angle paddler usually wants a blade that is thinner and longer for the greatest efficiency. 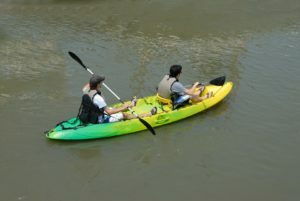 This type of paddling is most often used for recreational and touring kayak activities. This type of paddler keeps the shaft more vertical to the water, usually using an aggressive stroke with a fast cadence. 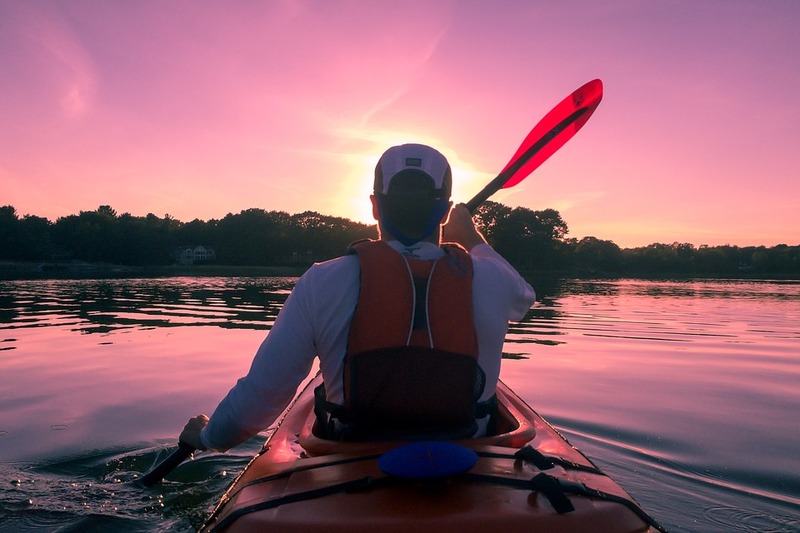 A wider, shorter paddle is usually best for high-angle paddling, allowing a bigger power stroke for quicker acceleration and maneuverability. This type of paddling is most often used in whitewater and racing and sometimes with touring kayaks. It requires a higher level of fitness than a the more relaxed low-angle style. Okay, now that you have an idea where your kayak use and paddling style will lead you, paddle-wise, let’s talk about some of those features we saw above. What type of material is right for your needs? The cheapest paddles usually have an aluminum shaft with plastic or nylon blades. These are the most affordable paddles materials available. They are also very durable and are less likely to break. The blades are usually thicker, so they tend to be heavier than their more expensive carbon or fiberglass cousins. The downside is that plastic blades are flexible which makes them less efficient as you will lose some power in the stroke. An aluminum shaft can also make your hands quite cold in cooler air or water temperatures as it will conduct the heat away from your hands. The mid-priced choice is fiberglass. Both the blades and the shafts can be fiberglass. These paddles are lighter than plastic and a good compromise between the more expensive carbon paddles and the cheaper plastic/aluminum. They are fairly durable, though not as much so as plastic, but they can be made in a wide range of color choices and design styles. The lightest material of the bunch, carbon paddles will suit those who want the lightest paddle available on the market. This material is certainly best suited to those who plan to cover a lot of distance and will be making many paddles strokes each trip. The decreased weight will “add up” to big advantages in efficiency and lack of fatigue over the long haul. The downside is that carbon blades are more sensitive to chipping and cracking from impact with rocks, etc. Some paddles have both blades parallel to one another, while other paddles have what is called feathering of the blades. This is when the blades are set at an angle to each other to minimize wind drag from the blade that is out of the water. A feathered blade will have the long edge into the wind while the face of the other blade pushes through the water. Blades are generally feathered from 15 to 60 degrees, depending on the use and conditions. Some paddles have the ability to adjust the feathering in the field. Whitewater paddles tend to use a feathering angle of 35 to 45 degrees. While feathered blades increase the efficiency of the stroke and minimize wind resistance, they can also produce more strain on the wrists and shoulders, so this must be taken into consideration. Many paddles come with round shafts which allows for great flexibility in rotation. However, some paddlers prefer an oval shaft. The oval shaft helps the paddler position the paddle at the correct angle more quickly and automatically. This is largely a matter of comfort and preference. Paddles are available that break down into two, three or more pieces for easy storage and transport. Some paddles telescope down to a very short length. These types of paddles are especially beneficial for whitewater kayaking where the possibility of losing or breaking a paddle is very high. Collapsible paddles can be stowed in the compartments in the kayak. So what length of paddle is right for you? How wide is your kayak? Here is a handy chart to help you decide the paddle length using your height and the width of your kayak. This is a general go-by and sometimes people have reasons they prefer a different length, but this can get you started. 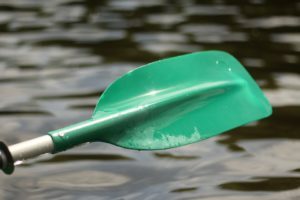 If you are very fit and want an athletic workout when you paddle, you might want to choose your paddle on the shorter side. You might also want to choose a wider blade to get more power in each stroke. If you are a heavy person or on the tall side, you will probably want a longer paddle that has a wider blade to move you through the water more efficiently. If you are a smaller person, or a person who is not concerned with a lot of speed, you might want to choose a paddle with a smaller blade. Do you have shoulder or wrist problems? You might want to choose a smaller-bladed paddle with lightweight materials such as carbon fiber, in order to reduce strain on your those joints. We hope this guide has been helpful to you. If you are ready to search for the best paddle for your needs, please click here to see a complete assortment of paddles to suit all your needs. I’ve definitely wanted to go whitewater rafting before! It makes sense to carry a backup paddle just in case something happens to one that you’re using. I guess for being in a kayak I didn’t know there were so many options to think about when buying. I’m a big fan of carbon fiber and would probably choose those in the case of going in the river. There is a lot of choice in the carbon fiber models these days. You will pay more on average, but you will get a lighter paddle. Thanks for the comment! I haven’t kayaked in a while due to a shoulder injury, but used to a lot. Your comment about choosing a different paddle made me think perhaps this is a sport I could get back into with a bit of thought, and modification. Thank you! Bec, There are certainly some options available for you. Try some different paddles, maybe lighter weight too, and see if that helps you get back to doing something you obviously love. And if that doesn’t suit, there’s always pedal power! We reviewed a great pedal kayak here: Native Slayer Propel. Best of luck! Got here while researching for a multi-day trip next summer. We only ever had “standard” paddles that came with the kayak, I’m glad I found this page because it gives me hope. I’m quite short and it never occurred to me that with a different length and material I could actually make my life much easier and not tire so easily. Very excited, thank you. Glad to help! If you are going on a multi-day trip, you really want to be happy with your set-up. Be sure to review our article on “Choosing the Right Kayak” too! Thanks so much for this awesome article. A year ago I had researched material on a kayak for touring, but the info out there is sparse and confusing. So I am delighted that I’ve found your site. 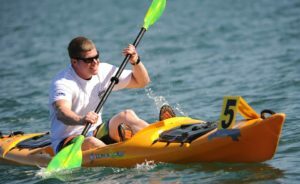 I also hopped over to the “how to choose a kayak” article, which is equally informative and has great depth. You make it really easy to find all the info ! I will be back to check for more.